Weekly Recap #6: Merry Christmas! This week we just want to wish you all a merry Christmas, as we’re taking a few days off to spend with our loved ones! Happy Holidays everyone, thanks for following us and see you next week! Besides adding some new stuff to the super secret first boss, Fred has been swinging away at some new skills and NPC sprites! This here is one of the early skills from the one handed weapons skill tree (we have 8 trees in total). 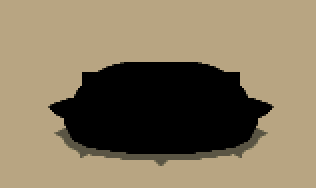 We haven’t got a proper name for it yet, but it plunges the hero forward damaging anything in it’s path. Range and damage increases by leveling it up. Only the best are chosen. Weekly Recap #4: More portraits and more illness! 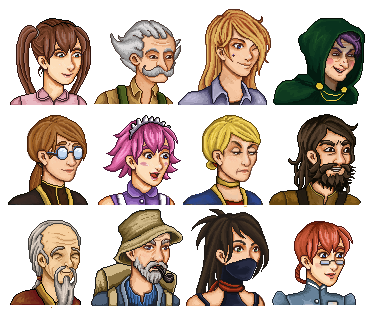 This week Vilya spent doing no less than 29 portraits for different NPCs! Some of them you’ll see below – who do you think they are? She also made these market stands where you’ll be able to get a variety of special items! 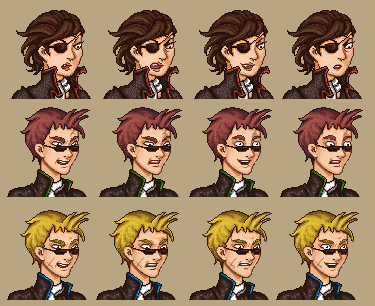 The character sprites were made by Fred afterwards – can you pair them up with the correct face above? Besides doing the market NPCs above, he has been able to squeeze in most of the animations needed for our treasure system! We’ll post a video about it once we got it all set up, in the mean time you will have to settle for some animations off the main character digging up some treasure. Ancient ink will guide your steps. Next Week: The portraits start getting matching NPC-sprites and Vilya visits her parents! Teddy takes on the trial of setting up the trials!